Erdogan tells Turks to check under their pillows for gold as Turkish lira nosedives to record lows. President Donald Trump abruptly announced Friday that he would double the rate of import tariffs on Turkish metals — forcing Turkey to ask citizens to buy its own crashing currency. The Turkish economy was already mired in crisis amid worsening relations with Washington and worries over soaring inflation and unemployment. Trump tweeted he had authorized a 20 percent duty on aluminum and 50 percent one on steel. "Our relations with Turkey are not good at this time!" he noted. The sudden announcement turned a run on the Turkish lira into a rout; it crashed more than 18 percent to a new record low against the dollar. "If there is anyone who has dollars, euros or gold under their pillows, they should go exchange it for liras at our banks,” he said Friday. “This is a national, domestic battle. This will be my people's response to those who have waged an economic war against us." He said the government has “preparations for all kind of negative possibilities,” adding: “Those who rub their hands by looking at currency, interest rates and threats should not get excited in vain. You will not make money at the expense of Turkish people." 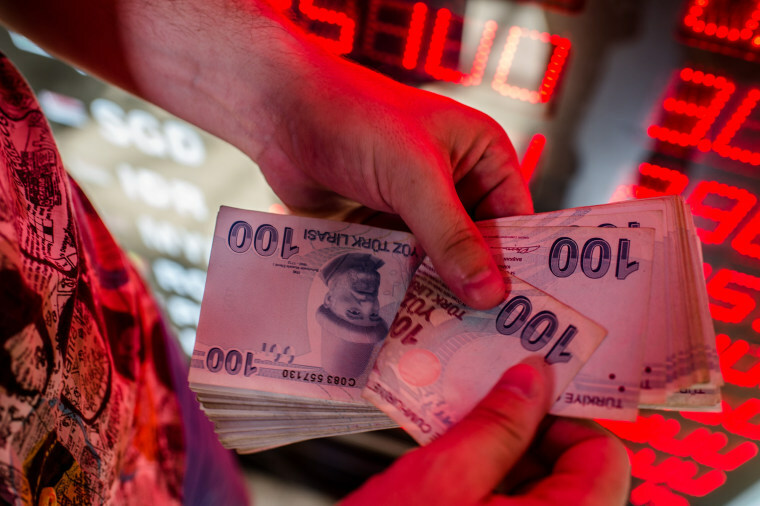 As he spoke, the lira fell further — adding to worries about the country’s financial stability. One of the triggers of the turmoil has been a standoff with the U.S. over detained American pastor Andrew Brunson. Turkey, a NATO ally, put him on trial for espionage and terror-related charges linked to a failed coup attempt in the country two years ago. Washington has demanded the pastor's release and last month imposed financial sanctions on two Turkish ministers. High level meetings in Washington between U.S. and Turkish officials ended this week without an apparent resolution. Aylin Ertan, a 43-year-old caterer in Ankara, said she was concerned over the future of her small business. "The price of the food that I buy increases day by day, the fuel that I put in my car to distribute lunches is more expensive, but I cannot raise my prices from one day to the next," she said. "On some days, I end the day with a loss." Erdogan on Thursday portrayed the run on his currency as a "campaign" to harm Turkey and called on people not to worry. "If they have their dollar, we have the people, we have Allah," he said.